OK, moms. When was the last time you felt really, truly relaxed? Completely at ease, stress free or pampered? Valentine’s Day offers us the perfect time to show some love (to ourselves!) and take a break from our demanding routines. Seattle-based East Asian medicine practitioner and acupuncturist Nicole Sharkey says stress often shows up as anxiety, depression and chronic pain. That nagging, knotted shoulder ache? Blame your unfinished to-do list. And when your body begs for a break, listen. “Relaxation is the primary time in which our bodies recover from external and internal stressors. We ﬁght illness, heal damaged tissues and regenerate vital hormones during these times,” she says. To combat stress, we need to build an arsenal of surefire ways to unwind. Sharkey says activities such as exercise, meditation, gentle yoga and deep breathing bring us out of the fight-or-flight cycle of our daily lives and into the rest-and-digest mode. When our energy is focused on the way our bodies are feeling, we’re more prepared to take on challenges. Activities that allow us to harmonize our bodies and minds into unified movements bring the deepest relaxation, says Sharkey. Acupuncture treatments, for example, can offer centeredness, calm and improved sleep patterns. Switching our focus from others onto ourselves is not easy. “Bodily sensations are happening in the present, so bringing awareness to how our bodies feel is great for calming down and lowering stress,” says Seattle-based massage therapist Laurie Swanson. Simply sensing how your breath feels as it moves through your body can relax multiple muscle groups at once. 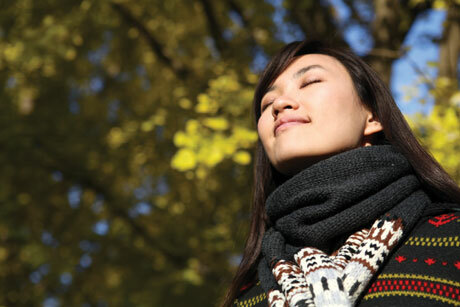 When you feel overwhelmed, try taking 10 deep, metered breaths to relieve tension, Swanson suggests. The good news is that we can practice relaxation — even in one-minute increments. Over time, the practice will create new thought patterns that make it easier to relax. So, go ahead — loaf a little. 1. Just breathe Something as simple as slow, metered breathing does wonders for settling our bodies and minds. Put the focus on your breath by taking calming breaths throughout the day, like before you eat a meal or before you pick up the phone. Ten deep breaths in through your nose and out through your mouth is like an “off” switch for stress hormones. Remind yourself to check in on your breathing during the day, and don’t forget to smile. 2. Walk around the block Exercise is an amazing way to de-stress. It balances hormones, improves circulation and promotes healthy organ function while allowing our minds to pause and focus on movement. Take a morning or evening walk with your family to prepare for, or unwind from, your busy day. 3. Take a (scheduled) time-out Scheduling time to relax is not selfish; it’s critical for our bodies to recover from the day’s stresses. Even finding the time to relax or stretch in one-minute increments can help us refocus our energy on ourselves. When we care for ourselves, we become healthier, more productive family members and coworkers. 4. Turn down the noise If your day overwhelms you before it even starts, block off a no-email, no-phone, no-distraction period when you can sit down quietly knowing that, barring an emergency, the world will wait. Replace the noise with soothing music or just silence. You may find that as you slow down, the world around you settles down a bit as well. 5. Find what energizes you Acupuncture, massage, yoga and guided meditation are all excellent ways to experience deep relaxation. These experiences remind our bodies of what it feels like to release stress and guide us toward balance and a more relaxed lifestyle. Whatever it is that brings you energy, put your to-do lists aside and find the time to do the things that you truly love — for you.